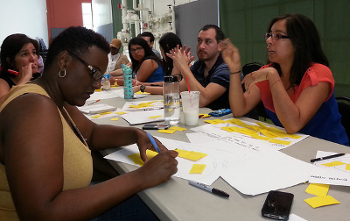 Our Social Justice Technology Skillshare took place at Mercado La Paloma in Los Angeles on Wednesday May 6, 2015. This was a community-driven event designed for up to 30 organizations in LA to connect with other nonprofit and grassroots staff about leveraging technology and online communications to support social justice work. Weaponized Social in Nairobi, Kenya took place on Saturday, May 2, 2015. We invited sociologists, data scientists, peace builders, developers, activists, and anyone passionate about supporting a healthier online ecosystem to join us at the iHub in May. Acompáñenos el 14 de Abril a las 9 a.m. en el SF Nonprofit Tech Center para un taller de comunicaciones en linea diseñado para personal de organizaciones no lucrativas y organizaciones de comunidades pequeñas. Este taller se dará en Español. Fortalezca sus comunicaciones con nuestro taller colaborativo gratuito en como usar los Cuatro Procesos de Aspiración. Acompáñenos el 24 de Marzo a las 10:00am en el SF Nonprofit Tech Center para un taller de comunicaciones en línea diseñado para personal de organizaciones no lucrativas y organizadores de comunidades. Este taller se dará en español. Aumente la efectividad de sus comunicaciones en línea con nuestro taller gratuito sobre cómo coordinar sus comunicaciones en línea dentro de su organización. We helped organize the Circumvention Technology Festival in Valencia, Spain in March 2015. Spanning a week of workshops, hackathons, and social gatherings, the #CTFestival brought together participants from around the globe to connect, share resources, and collaborate on efforts to fight censorship and surveillance. Weaponized Social took place on February 13th and 14th in New York City. It was a first of its kind for Aspiration. A big love bomb of thanks to all who participated. Thank you to all who participated. You can check out the results and vision moving forward in the TA Bridge blog. We co-organized a unique “Follow the Money” workshop with the Transparency and Accountability Initiative (TAI) on January 20-21 in Berlin as part of the TABridge program. Is your social justice campaign ‘data-ready’? Almost everything connected to social justice is a data project in one form or another. This workshop facilitated by Dirk Slater of FabRiders offered practical knowledge about utilizing data in a variety of campaigning contexts. Participants gained a better understanding of how to get data, how to turn it into useful evidence, and how to make it accessible and interactive. Aspiration's annual Dev Summit took place on Nov 17, 18, and 19, 2014 from 9am - 5pm at Preservation Park in Oakland. This event brought together activists, nonprofit staff, and developers interested in creating technology for nonprofit and social justice efforts. 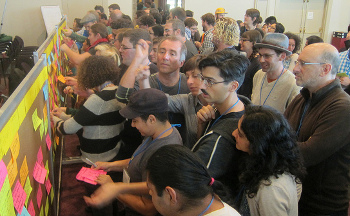 A big love bomb of thanks to all who joined in the fun at this year's highly spirited and interactive gathering of folks who are passionate about developing software tools to support the work of social change organizations and community activists. Thank you to all who attended this online webinar to learn the how, where, what and why of email newsletter asks. We were excited to offer this training as a webinar for the first time.